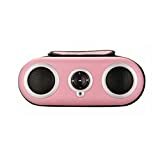 iHome has today announced it will team up with the American Breast Cancer Foundation to donate a percentage of its sales of the pink iH19 Portable Water-Resistant Stereo Sport Case (compatible with iPod, Shuffle, and most other MP3 players) to breast cancer research. Pink is the internationally recognized color for initiatives linked to breast cancer awareness and research. The iHome iH19 (RRP $70) is a water-resistant case with integrated dynamic stereo speakers and built-in remote control. It features a sturdy zippered case that can be attached to bikes, strollers, and exercise equipment with the included brackets. If you are looking for a stylish accessory to listen to your iPod everywhere, you can now help a good cause with your purchase!